The Forum Building (Catalan: Edifici Fòrum, IPA: [əðiˈfisi ˈfɔɾum]; Spanish: Edificio Fórum), also known as Museu Blau de les Ciències Naturals, is an architectural landmark in Barcelona designed by the Swiss architects Jacques Herzog and Pierre de Meuron (Herzog & de Meuron),. The building is triangular in shape, measuring 180 metres on each side and 25 metres in height, located within the triangle formed by Diagonal Avenue, Rambla de Prim and the Ronda Litoral. It was the symbol of the controversial 2004 Universal Forum of Cultures and the serious flaws that arose during its construction were widely covered in both the Spanish national and foreign press. The building has become a political bone of contention, with the opposition parties in both Barcelona Council and the Parliament of Catalonia demanding to know why it cost so much (of the order of US $144 m). The building has an auditorium with a seating capacity of 3,200 and an exhibition hall covering nearly 5,000 square metros. When we started in January 2001 with the design for the building to house the Barcelona Forum 2004, the site was a so-called “terrain vague”, urbanistically speaking a “no-man’s land”, with industrial installations, a residual water treatment plant and a petrol station. While it had some elements of exterior design, such as a sculpture that functioned as a fountain and a small park, there was still a lot of open, vacant land. According to the established schedule, in a period of three years, this entire area was to become part of the architecturally organized and well-defined city. 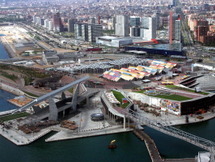 The aim was to convert the chosen zone into the most important and significant district of 21st century Barcelona. The site is located at the very end of the Avenida Diagonal, where it meets the Mediterranean coast and connects to a newly created gigantic artificial platform, spanning over the Ronda Litoral. Barcelona is a European metropolis that through its history, climate and the customs of its inhabitants, is predestined to make use of its exterior space, according to its respective configuration, as a living urban location of its social interrelations. For this reason, we decided instead of planning the building as an independent object within an open space, we would propose a building that generates and structures this open space. To allow for the maximum combination of functions, maximum flexibility and spatial interaction, we also decided that the program, such as the auditorium with 3,200 seats, large exhibition areas, foyer spaces, small administration areas and the restaurant should be organized horizontally. With these ideas, the elevated flat triangular body emerged almost spontaneously, because it maximizes the possible footprint by forming an extensive cover for the plaza and perfectly expresses the specific situation of the land it occupies between the branches of the right-angled Cerda Grid and the Avenida Diagonal. The open public space that emerges under the triangular body is thought as a hybrid space, a mixture of several urban typologies. A series of courtyards that cut through the elevated volume as well as the artificial platform establish multiple relations between the street level and the other levels of the building, while always permitting new angles of vision and a changing play of light. The shape of these courtyards derived again from the juxtaposition of the two directions of the grid of Cerda and the cut of the Diagonal. In order to generate and maintain vitality and interrelation, additional program units are included, such as an open market space with a large fountain, a place for relaxation and meditation around a dripping water courtyard, a small intimate chapel, a bar, a kiosk and other simple facilities that complement the conference and exhibition centre. The buildings satisfy the needs of all social levels: for tourists and the citizens of the city; for culture enthusiasts and conference attendees; for young people and older people. The interiors of the auditorium and the exhibition are designed as hybrid spaces, not only blurring the boundaries between exterior and interior, but which also easily adapt to the constantly changing program. The auditorium is neither a bare conference centre nor a philharmonic music hall; the exhibition area is neither a predictable convention centre nor a classical museum space. The atmosphere of these spaces will change with the program and the building will redefine itself accordingly. The conception of a building with a coupling of interior and exterior space, as well as the flexibility of the program responds to the need for social durability from the collective point of view. 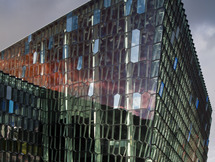 The result is a building that is topography.